It's not an official count, but Apple has reportedly seen 500,000 apps pass through the App Store. The findings were released jointly by 148Apps, Chomp, and Chillingo, with one caveat: The half-million figure includes apps that have been replaced or withdrawn. If you take these away, the current App Store count is roughly 400,000. Either way, it's a milestone, and Apple will surely brag about it at the Worldwide Developers Conference in June. By comparison, Google's Android Marketplace has a not-too-shabby 294,000 apps, according to Fortune, although one research firm expects Android's app count to surpass iOS's in August. I'm not too excited about the app horse race any more. A high app count makes for a good marketing bullet point, but if a platform can provide the basics--Netflix, Twitter, Skype, Kindle, an offline reading app, and some great games--I'm satisfied. In that regard, Android has pretty much caught up with Apple in offering lots of popular apps, though it still has a few holes. Most iOS apps are games (16 percent), books (14 percent) and entertainment (11 percent). I'm guessing that "books" refers to reading apps such as Kindle and Nook, because those are often the most popular apps in the App Store. The average price for paid apps is $3.64, and 37 percent of all apps are free. 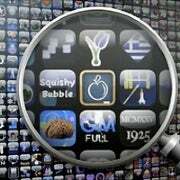 The most popular price for paid apps is $0.99, accounting for 29 percent of the App Store. Angry Birds is by far the most popular iOS app based on the number of days in the number one spot. It's held the throne for 275 days, compared to 38 days for The Moron Test, which in second place. To buy every app in the iOS App Store, you'd need about $892 million.